In Growth Analyser RCT growth references are available for many anthropometric measurements such as height, weight and head circumference, for a large amount of geographic regions and syndromes with endocrine features. Growth Analyser RCT offers tools for the calculation of standard deviation scores (SDS), the prediction of height velocity during the first year on growth hormone treatment, adult height prediction (Bayley & Pinneau) and the calculation of sample size or power. 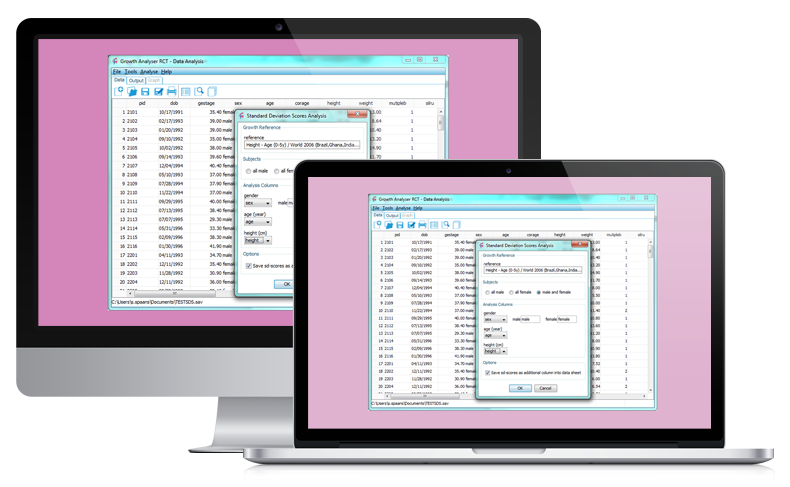 Growth Analyser RCT allows to perform growth and development analysis on data as available in Microsoft Excel (.xls or .xlsx) and SPSS (.sav) database files. Growth Analyser RCT includes over 200 (inter)national growth references for normal populations as well as populations with endocrine disorders. In consultation with us, additional growth references for any population can be added to the database.